This tapis skirt is probably a Tapis Balak, which means Large or Arrogant Tapis. The name comes from the bold geometric design and the extensive gold wrapped threads. The names of patterns can vary, however, so this skirt could also be Tapis Kaca, which means Mirror Tapis, a name that comes from the heavy use of sequins. 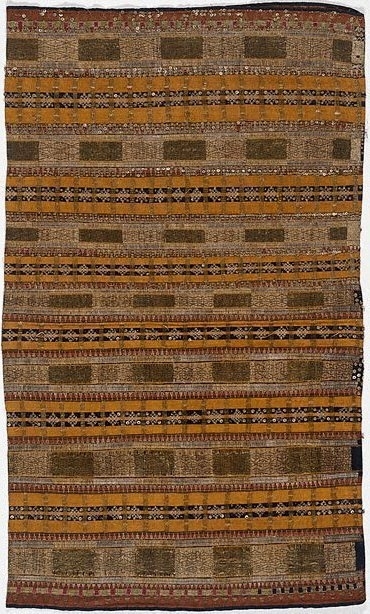 As is typical of Sumatran tapis skirts, this piece is composed of two sections joined together. The colours of the warp threads are brown, blue, and ochre, and the weft is brown. The skirt is decorated with sequins, many of which are attached with the embroidery technique called French knotting. Purple and green silk threads, in addition to the gold- and silver-wrapped threads, have been attached to the surface of the skirt by the decorative technique of couching ('cucuk'). The plain threads used to hold the gold-wrapped threads in place have been sewn in patterns, a decorative technique called 'sasab'. The stripes and geometric forms are popular decorative motifs on tapis cloths. Tapis are elaborate skirts made in Lampung province, Sumatra, Indonesia. Women wore them with matching jackets during special events and ceremonies. 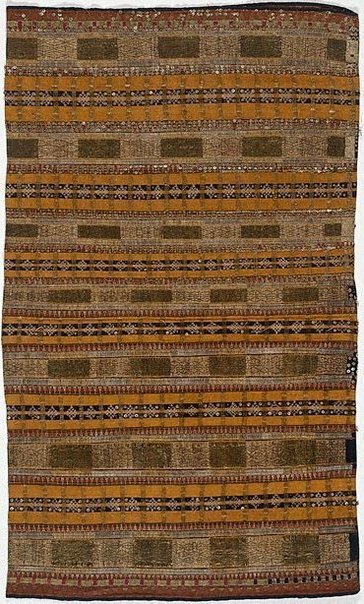 Tapis were high-status ceremonial textiles that indicated the social rank of the wearer and her family. People also gave these skirts away as prestige gifts to indicate a family’s wealth and social standing. Tapis therefore were associated with power, status, and wealth. The more elaborate the skirt and those with the most gold-wrapped threads denoted the highest rank. Widows’ skirts, however, had limited decoration. There are many social groups in Lampung, and these are called 'marga'. Each has specific conventions for clothing. These social regions are also divided between two traditions of social rules ('adat') – the Saibatin and Pepadon groups. The Saibatin have hereditary chiefs, while the Pepadon groups choose their chiefs based on achievements. Colours and the organisation of the stripes of the foundation cloth relate to the many clan groups in Lampung. For example, the Semangka from the southwestern coast employed bright red and yellow colours, and covered the dark, indigo blue sections of the fabric with secondary decorations. The Kauer people used darker colours with narrow red and yellow stripes and numerous mirrors. Among the Lampung groups, only the Kauer wore a short jacket with the skirts. Of course, the regular social and business exchanges between people in Lampung means that many of the skirts incorporate ideas beyond the 'marga' in which it was woven. The tapis skirts in the AGNSW collection have base fabrics woven in warp-faced plain weave where the warp (threads tied to the loom) and weft (threads interlaced with the warps during weaving to create the cloth) intertwine alternately. Warp-faced means that there are more warp threads than weft ones, so the weft threads are hidden from view. Traditional colours on tapis cloths include dark red, browns, indigo blue, dark green, ochre-yellow, and cream. The main decorative materials comprise horizontal, coloured stripes, gold- and silver wrapped threads, beads, pieces of felt and woven wool, and coloured yarns. The metal-wrapped threads, felt, wool, and coloured threads are couched (attached with stitches; 'cucuk') onto the surface of the cloth. The metal-wrapped threads are fastened to the fabric with threads sewn in a pattern, a decorative technique called 'sasab'. Sometimes the gold-wrapped threads were attached to paper-card before being couched onto the fabric. In addition to couching decorative materials to the cloth, the weavers also used brightly coloured yarns to embroider patterns onto the skirts. 'Cermuk' (pronounced chermuk) was the application of mirrors and mica to the tapis cloth. Since tapis are elaborate productions, making one could take up to a year.